Thanksgiving | poor scientist. will blog 4 food. Ooh, look, a timely recipe for Thanksgiving! I know I can’t be the only one in the world who prefers dry stuffing (a.k.a. NOT soggy bread from being stuffed inside a bird for hours and hours). So, as a public service, I thought I’d post this simple recipe that I adapted from EF, whose family got it from the Betty Crocker Cookbook. I’ve made this a few times, and I will tell you that the bread matters. A lot. I used a loaf of Semifreddi’s sour rustic bread this time, but any high-quality bread will do. It’s also better if the bread is stale, so that it’s dry and can take up more flavor. If you can, get the bread the night before, tear it up into bite-sized pieces, and let it sit out overnight. If you’re short on time, cut the bread into 1 inch slices and bake at 225 degrees F for 30-40 minutes, being careful not to toast or brown it. After drying it out at low temperature, take the bread out of the oven and tear it up into bite-sized pieces. EF noted when she gave me this recipe: “This is a LOT of margarine but you have to just trust it.” She also said not to make it with all butter, as it turns out kinda greasy. In a large skillet, melt margarine/butter. Add 1/4 cup of the broth to the margarine. Add onions and celery and cook until onion is tender and translucent. Turn off heat. Add 1/3 of the bread cubes into the skillet and mix thoroughly. Add mixture to the remaining ingredients in a large, deep bowl and toss thoroughly. Transfer to a 9 x 13 inch baking dish. Drizzle remaining broth over the stuffing. Cover the dish with aluminum foil. Bake for 20-25 minutes. Take off the foil and brown for another 15 minutes. Enjoy! And I hope everyone has a happy and delicious Thanksgiving! Categories: cooking, photos, recipe | Tags: recipe, stuffing, Thanksgiving | Permalink. Gather round, and let me tell you the tale of the Sweet Potato Debacle of Christmas Eve 2010. I was meeting TC’s extended family for the first time, and our duty was to bring a sweet potato dish. Um, no pressure or anything. I had a winning recipe in hand for mashed sweet potatoes, but I made one crucial error: I bought the wrong kind of sweet potatoes. I ended up with the white ones, which, as most people know, are NOT the kind you should serve at the holidays (actually, I don’t recommend them at all, but that’s just me). Anyway, being that we cooked them at the last minute, we had very little choice but to make the most of the situation. Which, in this case, involved putting another whole stick of butter into the potatoes. “Butter makes everything better,” I always say (that is, before the lactose gets the better of me). Fast forward to this past Thanksgiving. We were again given the responsibility to bring a sweet potato dish. It was a second chance to redeem myself, and there was a lot riding on the outcome. Both TC and I knew the seriousness of the situation, so we did our homework and chose not one, but two recipes for the occasion. Also, 30 guests were expected, so we need to to make a lot of sweet potatoes. I scoured the Food Network recipes, narrowed it down to 5 or 6 dishes, and TC made the final decision. The verdict? I liked both of these, although they were very different. One was a roast, and the other was a casserole, but both were relatively simple and healthy recipes that I heartily endorse. First up: Elie Krieger’s Sweet Potato Pecan Casserole. The recipe is pretty much perfect, so I won’t copy it here. The part I enjoyed most about this dish was that it was fluffy, kind of like a souffle. The sweetness was just right too; I hate it when my sweet potatoes taste like dessert (exception: sweet potato pie). As much as I liked it, it seems more like a holiday dish to me, so it’s unlikely that I’d make it at other times of the year. That, and I’d probably eat half of it at one sitting. Combine all the ingredients in a large bowl, mixing thoroughly with a spatula. Lay the sweet potatoes out in a single layer on a roasting tray. Drizzle any residual liquid over the potatoes. Roast for 30 minutes or until tender. Of course, I have to thank TC for helping to make Sweet Potato Redemption of Thanksgiving 2011 possible. Team sweet potato FTW! Categories: cooking, photos, recipe | Tags: sweet potatoes, Thanksgiving | Permalink. 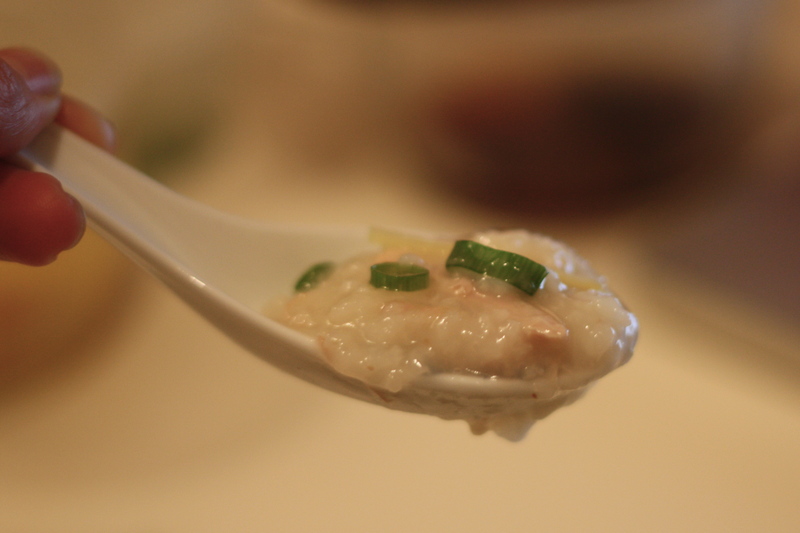 Last year, I blogged about making turkey rice porridge with the leftover turkey carcass from Thanksgiving. I decided to make it again this year and actually write down the recipe and share with y’all, because it is THAT GOOD. As good as the porridge is, it can be kinda boring by itself. Last year, I put shittake mushrooms in the porridge. To change it up this year, I made a shiitake and baby bok choy side dish that was, in my humble opinion, awesome. (Recipe below!) Since I made a TON of porridge, I had a few friends over to help me eat it. In addition to the mushroom/bok choy side dish, I also served Japanese pickles (radish and cucumbers) to add some crunchy texture and pretty colors to the porridge. You’ve probably thrown out that turkey carcass by now, but you can also make this dish with a chicken carcass (if you happen to have a roasted chicken around), or pork bones. Just scale down accordingly. 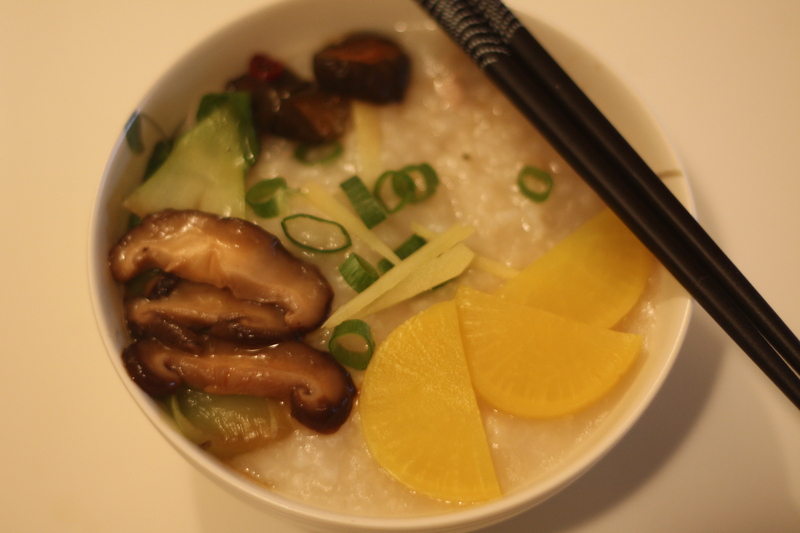 This recipe was inspired by my sister JS, who made an awesome turkey jook many, many Thanksgivings ago. I was reminded of it a few years ago, and this is the 3rd year in a row I’ve made it. A new tradition! Cover turkey carcass with water. Add rice wine, salt, pepper, and ginger. Optional: Add a dash of sesame oil, Chinese white pepper, soy sauce. Bring to a boil and simmer for ~2hrs, skimming off fat along the way. In the meantime, cook the rice. Remove carcass from stock; drain and cool. Add cooked rice to the stock and continue to simmer, covered. When carcass has cooled, pull off residual meat off the bone, and add meat back into porridge. Shred any additional meat (leftover breast meat, for instance) and add it to the broth. Simmer, covered, until rice/stock mixture has turned thick and rice grains have disintegrated (about 1-2 hours). Garnish with green onion and ginger. This is a recipe I made up 2 years ago, when I happened to buy shiitake mushrooms and baby bok choy at the farmers’ market, and wham! Yummy new recipe! Combine oyster sauce, soy sauce, and water in a small bowl and set aside. Heat oil over medium-high heat in a large, heavy pan. Add garlic and fry until fragrant (~1min). Add bok choy and mushrooms to the pan, stirring often. Add a splash of water to “steam” the vegetables. 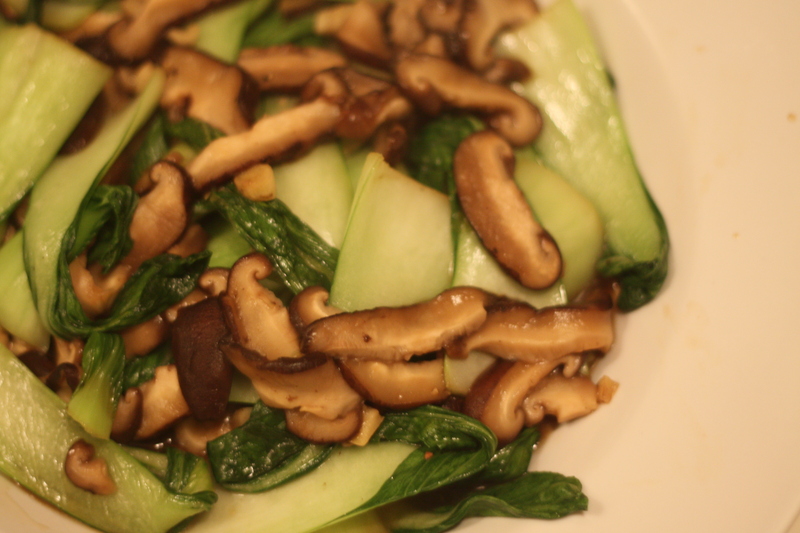 When veggies look cooked (mushrooms tender and bok choy slightly limp), add the oyster sauce, soy sauce, and water mixture. Mix everything together quickly and remove from heat. Alternative versions: For a true vegetarian dish, substitute oyster sauce with hoisin sauce or an extra tablespoon of soy sauce. To make it a main dish, add 1/2 lb of sliced firm tofu, pork, or chicken. Categories: cooking, photos | Tags: Chinese food, recipes, Thanksgiving, turkey | Permalink.